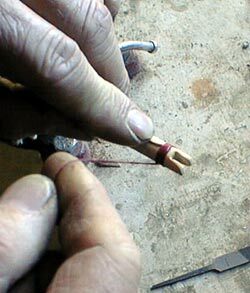 BASIC SELF-NOCKS - A self nock in its simplest form is just a slot cut into the end of the shaft. But that is just where it starts. Variations are limited only by imagination. In this segment I will discuss the simple version of the self nock using only hand tools. To make these nocks you will need three hacksaw blades, masking tape, a pencil, sandpaper, emory cloth, a clamp, a small file, artificial sinew or serving thread and some glue (the last two items are optional). 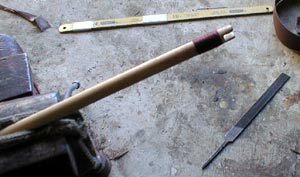 The first step is to locate the nock on the end of the shaft in the correct orientation to the wood grain. (See figure 1.) The nock should be cut perpendicular to the grain. This will reduce the likelihood of the wood splitting and will align the shaft so that the stronger side (resistance to flexing) will be against the bows riser. Take three hacksaw blades and tape them together using some masking tape. The three blades taped together will cut a width of approximately 3/32" (about .010"). Mark the location and depth of the nock on the shaft with a pencil to use as a guide for cutting the slot. I usually cut the nocks to a depth of 3/8", but you can vary that if you choose to have a deeper or more shallow nock. Clamp the shaft to a solid surface making sure the clamp doesnt mar or otherwise damage the shaft. Using the three hacksaw blades taped together, carefully cut the slot along the lines and to the depth marked on the shaft. You may want to practice a little on some old shafts before you take on that new dozen shafts that you just bought. The easiest way to round out the bottom of the slot is to use a piece of emory cloth. Take a strip about 6" long and a half inch wide and twist it until you get it into a chord. Take the chord and put it into the slot and pull it back and forth to round out the bottom of the slot. Round out along the edge as well as this will give the nock a "finished" look You can use sandpaper or a small file to round out the flat edges to your own taste. You may want to sand down the sides of the nock so that the thickness is similar to the thickness of a plastic nock. The weakest point on an non-reinforced self nock is at the bottom of the slot where the string makes contact with the shaft. If the nock fails it usually splits here. As an option you can reinforce the shaft by wrapping artificial sinew or serving thread on the shaft below the end of the slot. Just wrap the string around the shaft and put an ample amount of glue on all of the thread to hold it in place. I typically use 5 minute epoxy for this task. In a future article I will discuss self nocks that are reinforced with a hardwood spline or pin.